On our way to India, Mike and I spent two days in Amsterdam. Since I rarely drive in Chicago, Amsterdam is a city that’s after my own heart. It's completely walkable and bikes outnumber cars something like 400 to 1 (okay, that’s an exaggeration, but not by much). 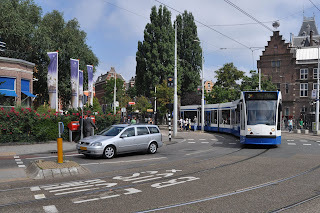 Bicyclists have their own traffic lane, but the roads in Amsterdam are curvy and crisscrossed, and riders gracefully weave their routes inches from the trams and skinny sedans. Bicyclists ride about without a care in the world – no one even wears a helmet. Each vehicle casually moves around one another like a comfortable, rehearsed dance routine. 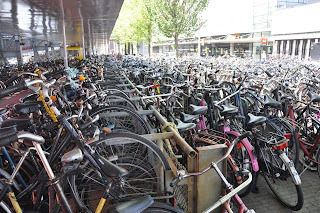 I was also awed by the thousands of bikes outside Grand Centraal train station. There’s a three-story bicycle garage and every inch is packed. It’s filled with rusty, old-fashioned, wide handle bar, fat seat street bikes. Not the mountain bikes we pointlessly ride up and down Chicago’s lakefront. I found the massive bike garage and the spirit behind it beautiful. I started a short story that takes place here. In this story, I’m trying to use the idea of fearless movement and practiced harmony. The few words I’ve written so far have a completely different tone than the pound-it-out-fast early drafts I’ve been working on lately. It’s a nice change of pace to have a mood in mind for a story, and I think it will develop slower. I’m sure it helped that I started this story freehand, armed with just a hotel pen and moleskin notebook. I’ve always struggled with setting in my stories and I think this trip will give me lots of practice. I’ve already hit a chord with something in Amsterdam. Unfortunately, it doesn’t involve giant wooden clogs. It sounds like you had a great time and were inspired! There's nothing like new horizons to shake ideas loose. P.S. I love the photo of the shoe. P.P.S. Considering what Amsterdam is famous for, I'm surprised that ALL of those bikers could navigate so seamlessly. Thanks for sharing, Lisa. I never would have imagined a three-story bicycle parking garage. LOL Karen, I was thinking the OTHER activity, but confused on the navigation thing. 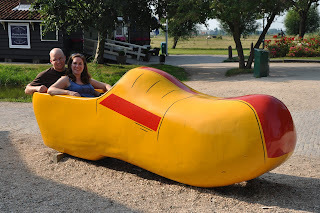 Giant wooden clogs = Story Gold.